America's growing population of men who do not work are also significantly disconnected from society, according to new research from Sen. Mike Lee's Social Capital Project. The SCP's analysis centers on what is called prime-age male labor force participation (PAMLFPR). The PAMLFPR measures the number of a) men (there are consistently fewer women in the labor force than men) who are b) in their prime working years, i.e. out of school but not likely to be retired, and c) "in the labor force," i.e. either employed or unemployed but actively looking for work. The PAMLFPR has steadily dropped for decades. At its low point in 2014, the PAMLFPR was 10 percentage points lower its highest point, in 1953. Economists and demographers have offered theories as to why, but no one is entirely certain what is causing the sustained drop. Dr. Scott Winship, who directs the SCP, has researched this issue in the past, extensively analyzing the composition of the not-in-labor-force (NILF) population in his work at the Mercatus Center. The latest report seeks to document the wellbeing of men outside of the labor force, tying the steady drop in the PAMLFPR to a decline in social capital. How are men disconnected from the community that work brings faring? "Compared with employed men … inactive men are more socially isolated, less happy, and have more adverse childhood experiences to overcome," according to the report. The SCP's major contribution to the preexisting literature is the incorporation of data from the National Epidemiological Survey on Alcohol and Related Conditions (NESARC), a nationally representative survey which captured Americans' alcohol use habits and associated pathologies. NESARC, which was administered in 2012 and 2013, asked its respondents about their labor force status, allowing the SCP to use its results to study the larger NILF population. So, who are the men out of the work force? About three quarters of the NILF prime-age male population are either disabled, retired, students, or homemakers, according to both the SCP's data and data from the Bureau of Labor Statistics. Winship's previous work indicates that only about two to three percent of the group meet the BLS's definition of a "discouraged worker," that is, someone who has stopped trying to find a job. Men out of the labor force are substantially worse off than their in-labor-force peers by a number of metrics. 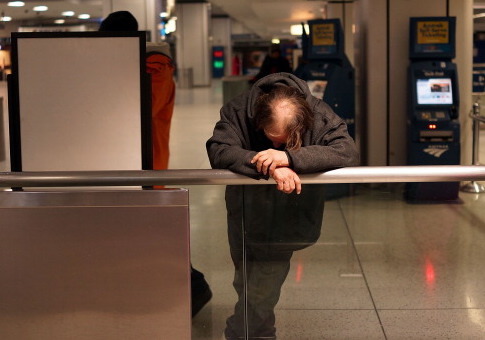 The results from NESARC show that men out of the labor force routinely have poor physical and/or mental health; "over one-third of them (and nearly three in five disabled inactive men) are in the bottom quarter, nationally, of both physical and mental health," the report notes. They are also more likely to have experienced adverse childhood experiences, including living in poverty and having their parents divorce. Most importantly, NILF men are less socially connected than their in-force peers. Based on their own reports, men out of the labor force are less likely to be invited to events by others, say they have someone for advice on personal problems, or be able to find someone to help them move. NILFs are also more likely to live alone, less likely to be married, and more likely to be divorced. This general disconnectedness, the report suggests, is likely tied to the way in which work is so central to how we form our social lives. "Coworkers constitute an important aspect of our social lives, ‘whether in the carpool lane, offsite at lunch, in the break room, at the holiday party, behind the counter during down times, out on business trips, or post-work at the bar or on the softball field.' The rise in inactivity, then, contributes to the withering of American associational life," the report explains. NILF men are more religiously connected than their employed peers, although that is largely true within the retired and homemaker subsets. However, they're also more likely to have passed through the criminal justice system: 35 percent of all inactive men, including 46 percent of disabled men, fall into this category. Recent research from the American Enterprise Institute has confirmed what is obvious: going to prison is strongly related to socioeconomic failure, especially among black men. 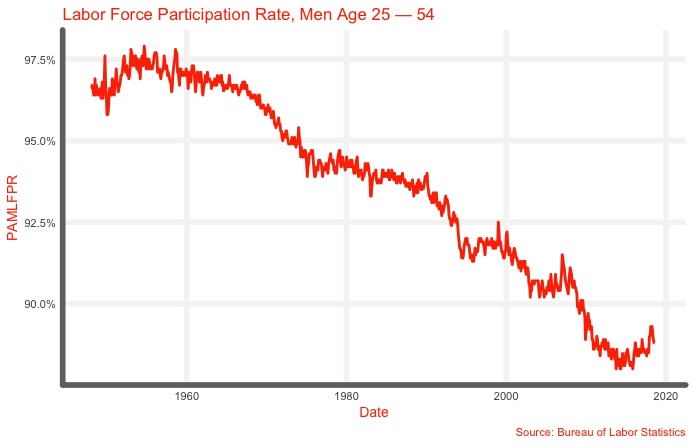 It is hard to ascribe cause and effect based on the data provided by the SCP: did declining labor force participation hasten America’s social coming apart, or vice-versa? What is clear is that there is a slowly growing proportion of the population who are worse off than their more socially connected peers, and who should therefore be a special focus of policy. "Compared with employed men, inactive men are more socially isolated, less happy, and have more adverse childhood experiences to overcome," the report concludes. "Whether through greater work, where appropriate, or by other means of connecting them to community, we ought to consider how we might expand inactive men's access to social capital." This entry was posted in Issues and tagged Mike Lee, Unemployment. Bookmark the permalink.